The GalCivIII-General is now separate from the EverythingElse-General, and I appreciate that. Ditto! Thank you so much... Things are manageable again. Great but why there are still new posts of ashes in??? Hmmm, I think it reverted back. I am now getting Ashes and Sins posts in the Recently Active Posts section again. In an effort to illustrate the problem I have a couple of screenshots I grabbed. 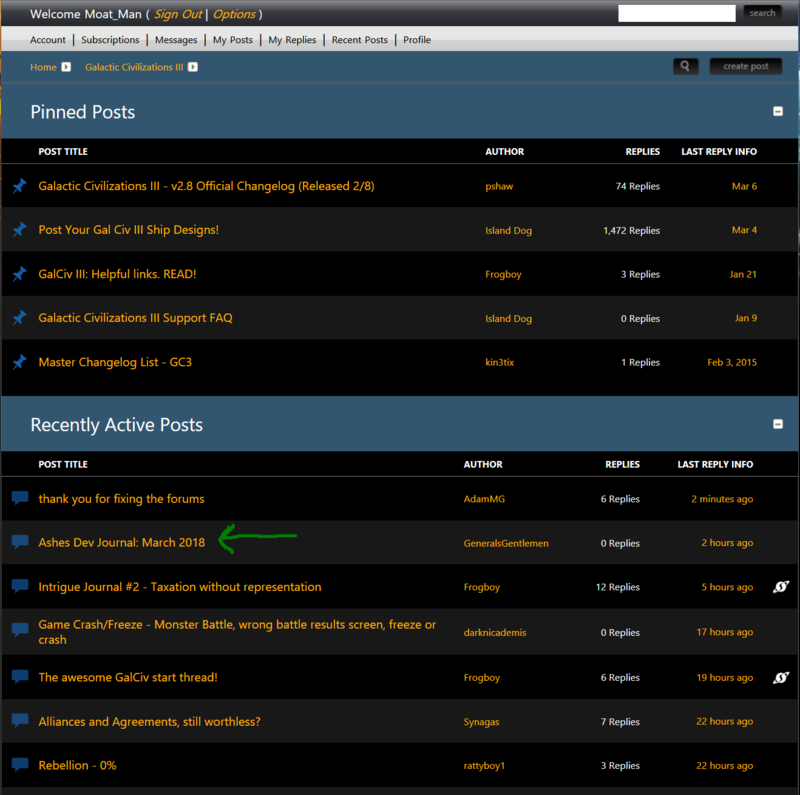 They show threads from other forums showing up when you are in the root Gal Civ III forum. This shouldn't happen. Right now there are not that many so it doesn't look bad but normally there are a ton from Star Control, Ashes, Sins, Other Stuff, etc. It makes browsing the recently active threads for Gal Civ III painful. I apologize in advance if the images are super large or break your browser. 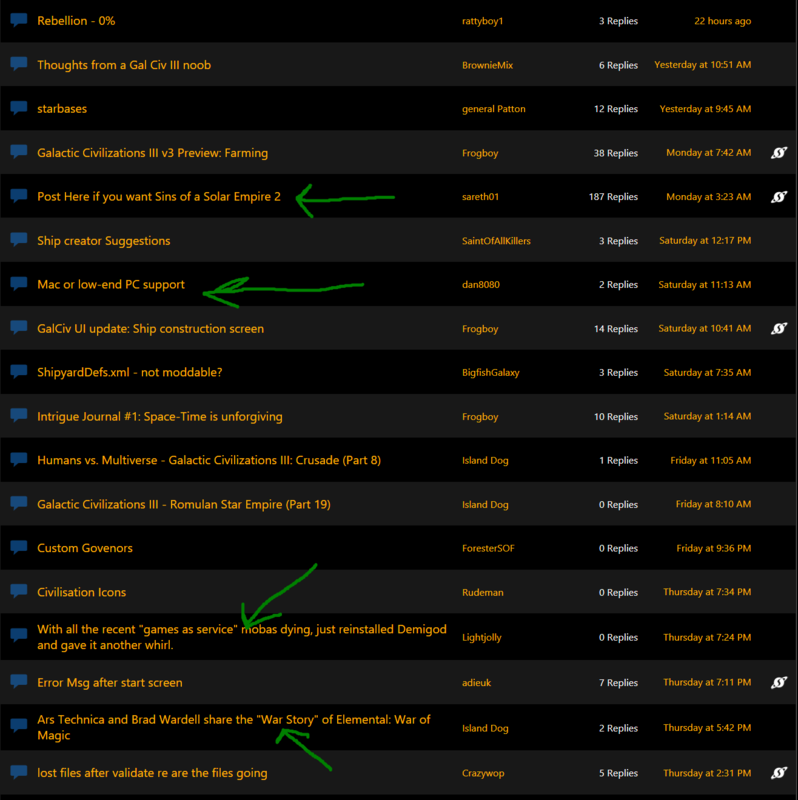 The first one shows the root and then the green arrow points to a thread that is from the Ashes forums. The second image is just my screen scrolled down to show some more threads that shouldn't be there. They are also noted with a green arrow. If you click on Stardock Games you can further select from Ashes, Offworld, etc. I chose one as an example. 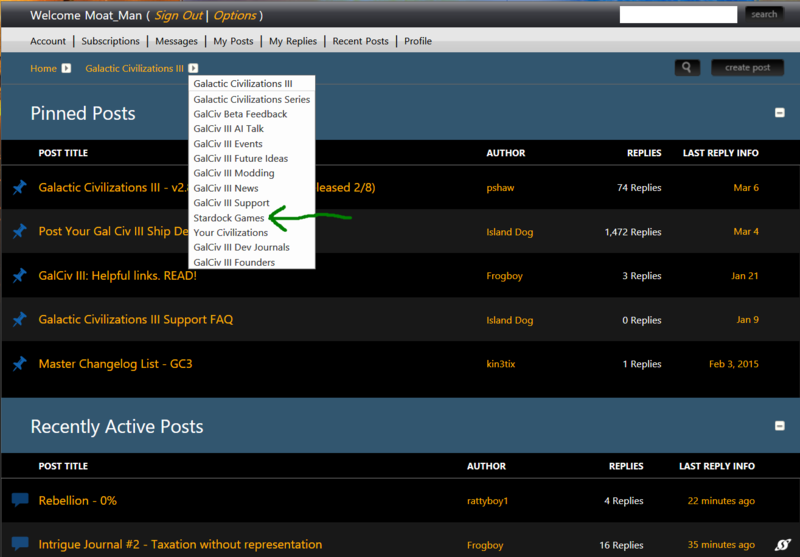 It's pretty strange that the Stardock Games folder is subfolder of the Gal Civ III forum. Will the Forum fixed in the next future? There are still Posts of all the other games in Is it really so difficult to make the Gal Div 3 Forum just for Gal Civ 3 Posts like it was some times ago? I doubt it. It was fixed for like a weekend, but then reverted. Very annoying. As a random guess (which might be very wrong), I'd say they have a duplicate key somewhere in the database. They fixed it again. When you click on the little dropdown next to Galactic Civilizations III you don't see the category Stardock Games anymore and the Recent Posts section only has Gal Civ III content. Let's cross our fingers it stays fixed!